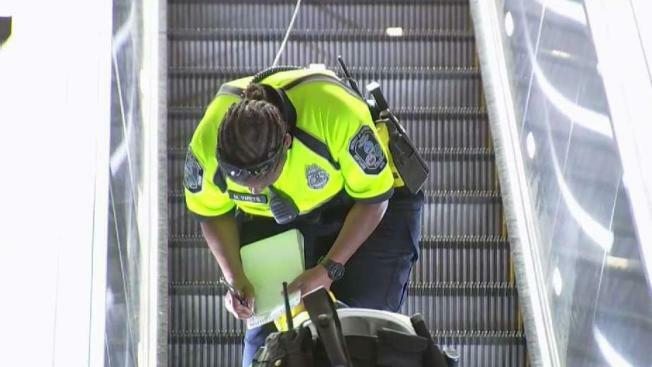 A man died in D.C. Wednesday after he tried to use a Metro station escalator while sitting in a wheelchair and fell backward, officials say. The man, who was not immediately identified, was fatally injured in the Columbia Heights Metro station, Metro spokesman Dan Stessel said. He was using an electric wheelchair in the Northwest D.C. station about 1:30 p.m. According to security camera footage, he initially tried to head up using the elevator, Stessel said. The man waited for the elevator for 10 to 15 seconds and then headed toward the escalator. He gripped the handrails on either side. But as he ascended, he fell backward and his wheelchair fell on top of him. The station manager and several bystanders helped him, but he was critically injured. "I seen a guy laid out. I saw his legs was all bloody really bad. I saw about 10 people crowded around him," said Shaun Stepney, who witnessed the aftermath of the accident. Paramedics found him at the bottom of the escalator and rushed him to a hospital where he was later pronounced dead. Information on the nature of his injuries was not released immediately. Investigators were on the escalator for hours taking photos and notes. The escalator is at the station's east entrance, between street level and the mezzanine level. Metro officials said the elevator the man tried to use before the accident was fully functional and it appeared to be operating normally hours afterward.